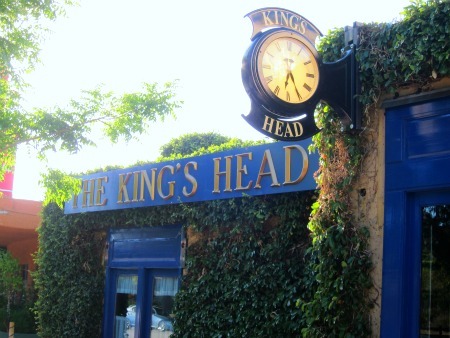 The British Are Coming: It’s the year of the Brit with the Queen’s Diamond Jubilee and the Olympics, so it’s fitting that the Ye Olde King’s Head is expanding from its first location in Santa Monica (which has been a fixture for 35 years) to Studio City. It is set to open this Friday, June 8, in the former Pinot Bistro locale—and just in time to watch the European soccer tournament Euro 2012. Enjoy a menu of British specialties including fish n’ chips, bangers & mash, shepherds pie, steak & kidney pie, cornish pasty and traditional English breakfast — and don’t forget the toffee pudding. There’s also a selection of salads, burgers, sandwiches and more, plus beer and wine. Tea service is available, but you must reserve in advance. Dine inside in the rustic country setting with Brit kitsch chic decor or enjoy your food and drink on the street patio enclosed in gated borders painted like a U.K. flag. Check out the gift shop for some wonderful English imports. Ye Olde King’s Head. 12969 Ventura Blvd., just west of Coldwater Canyon Avenue. What’s Happening With Bokado, You Ask? : Frank Leon, one of the San Fernando Valley’s most prolific restaurateurs has been very busy lately putting the final touches on The Village Studio City, which is set to open in July, and will replace his former restaurant, Bokado. Leon has created a legacy in the 818 running La Loggia for 27 years and Next Door Tapas for six years. When Bokado closed it was going to be re-opened by Leon, Ellen DeGeneres and a group of others as a vegan restaurant, but that deal is no longer happening and Leon is continuing his chef/owner duties with his new concept in dining. The Village is described as a gastropub and tapas lounge featuring small plates for sharing in the $5-$12 range. Dishes offer a twist on classic bar food (i.e. tempura cod and salsa brava, beef & lamb sliders with capers remoulade, and housemade shallot meatballs) and unique twists to typical dishes (pancetta wrapped tuna tartar, steamed carlsbad black mussels, and short ribs with polenta). There will also be a good selection of vegan choices, as Leon personally cooks for Ellen DeGeneres every week or so. The drink menu is created by Sherman Oaks locals Ron Patric and Randy Evans whose mixology experience includes consulting and designing cocktail menus for top LA restaurants, including Koi, as well as events such as The Emmys and Golden Globes. The specialty cocktails will be made from small batch and artisanal spirits, and premium ingredients, such as all-natural herbs, fruit and produce sourced locally at the Studio City Farmers’ Market. At 2400 square feet, the venue sounds like it will be unlike anything the 818 has seen so far —with an interior that includes a study with shelves full of vintage books and unique trinkets, as well as Moroccan themed seating area that can be closed off for private parties and events. The 1200 square foot outdoor patio is retractable and will include a fire pit, Edison bulb lighting, and a hidden photo booth. A highlight will be an outdoor brick pizza oven, where patrons will be able to custom order their personal pizzas and have them made in front of them. There will also be a U-shaped bar for ordering cocktails and small bites. Leon said that to transform the familiar neighborhood essence of The Village into a haven for a younger generation, he sought the advice of La Loggia and Next Door’s loyal, young Hollywood patrons, including Jessica and Ashley Simpson, Jennifer Love Hewitt, Shia LaBeouf and Ashley Tisdale. From those conversations, The Village was born. Stay tuned here for news about the opening next month. The Village is located at 12345 Ventura Blvd. in Studio City and will be open from 5 p.m. to midnight Sunday, Tuesday and Wednesday, and from 5 p.m. to 2 p.m. Thursday to Saturday.